We used our incredible buying power to get a special limited edition run of these awesome Advanced Aluminum Fujis built with pro level SRAM FORCE1 group and powerful FORCE HYDRAULIC disc brakes. You won't find a better equipped Advanced Aluminum bike anywhere else for this price. Full Warranties. Full warranty and Factory built by Fuji of top rated parts. Getting muddy has never been more fun. 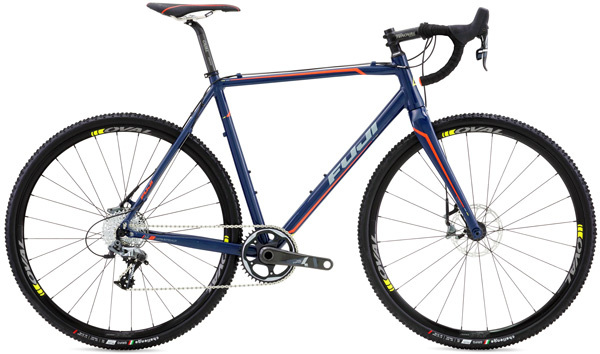 The Fuji Cross 1.1 cyclocross bike takes full advantage of the revival of aluminum frames to make a bike that's more fun, more durable, and a better value than pretty much anything else out there. The heart of the bike is the A6-SL custom butted alloy frame, with a PF30 bottom bracket and tapered headtube. This makes for a stiff, fast, and lightweight bike that can take all of your pedaling energy and turn it into forward motion with ease. Upfront, an FC-440 Cross full carbon fiber fork features flat-mount disc tabs for a slimmer, less obtrusive disc caliper mounting option. A tapered full carbon steerer and 12mm thru axle make the front end incredibly stiff, and makes lining up the disc rotor super easy after removing the wheel. Having a great bike is nothing without great components though, and the Fuji Cross 1.1 delivers with the latest from SRAM. The all-new FORCE 1 groupset brings the power of Hydraulic disc brakes, the simplicity of a 1x11 drivetrain to this bike, giving you better stopping power in all weather conditions and terrain, while simplifying the drivetrain for lighter weight and more intuitive shifting. FORCE 1 uses SRAM's excellent clutch rear derailleur system to eliminate chain slap and help keep the chain properly tensioned over even the biggest obstacles or adventures onto single track. The X-Sync chainrings pioneered the sawtooth chain tooth profile, eliminating the need for a chain catcher in a 1x setup, so you don't have to worry about the chain derailing or bouncing off the chainring when you hit some rough riding. The FORCE Hydraulic disc brakes also provide Pro Level, powerful, easily modulated stopping performance, even in wet or excessively muddy conditions. Coupled with 160mm front and 140mm rear rotors, the Force HYDRAULIC brakes are capable of tackling everything from a muddy November CX course to fire roads to some light singletrack. Wheels and finishing kit are supplied by Oval, with Oval 300-series alloy stem, seatpost and handlebars,and R500 saddle. Oval disc clincher wheels are light, durable, and tubeless compatible, and are all wrapped up in super premium Challenge Grifo 700x32 knobby tires, so it's pretty much ready to race straight out of the box. Full carbon tapered fork with 12mm thru axle, Carbon/Alloy SeatPost! 48cm - 5'1" to 5'3"
50cm - 5'4" to 5'6"
52cm - 5'6" to 5'9"
54cm - 5'9" to 5'11"
58cm - 6' to 6'3"